The studies on the effectiveness of Chinese herbal medicines (CHM) in treating liver fibrosis (LF) were not consistent. This study aims to systematically review the effectiveness of CHM on treating LF patients. Databases including MEDLINE, AMED, EMBASE, The Cochrane Central Register of Controlled Trials, China National Knowledge Infrastructure, TCMOnline, Chinese Biomedical Literature Database, and Chinese Medical Current Contents were searched up to March 2011. Randomized controlled trials (RCTs) involving LF patients receiving CHM, Western medicine, combined CHM and Western medicine compared with placebo, Western medicine or no intervention were included. LF markers including serum hyaluronic acid (HA), laminin (LN), procollagen type III (PC-III), type IV collagen (IV-C), matrix metalloproteinase (MMP), and tissue inhibitors of metalloproteinase (TIMP) were measured as primary outcomes. Liver biochemistry, including alanine aminotransferase (ALT) and aspartarte aminotransferase (AST), and improvement of related clinical symptoms were measured as secondary outcomes. Risk of bias of allocation sequence, allocation concealment, blinding, incomplete outcome data, selective outcome reporting, and other biases were assessed. Twenty-three RCTs with 2123 participants were analyzed in subgroups of types of comparison and study quality. Fifteen studies were graded as good quality. CHM alone and combined with Western medicine showed significant improvements in HA, LN, PC-III and IV-C compared with Western medicine alone. However, there were no significant differences observed between CHM and placebo treatments. The current inconclusive results in determining the effectiveness of CHM treatment on LF, due to the poor methodological quality and high heterogeneity of the studies, suggests that large RCTs using standardized Chinese medicine syndrome diagnosis and CHM formulae with longer follow-up are required for further evaluation. Liver fibrosis (LF), as a result of wound-healing response to recurrent liver injury, is thought to be an early reversible stage of liver cirrhosis . It is characterized by the formation of fibrotic scar tissue with abnormal accumulation of fibroblasts and myofibroblasts, and excessive synthesis and deposition of extracellular matrix (ECM) proteins. The development of anti-fibrotic therapy is important for patients with chronic liver diseases, especially for chronic hepatitis B (HBV) and C virus (HCV) infections , which are the most prevalent blood-borne viral infection and the major causes of LF worldwide, especially in mainland China [3–5]. Few LF treatments are effective and inexpensive without adverse side effect [6–8]. Categories of current research into Chinese herbal medicine (CHM) treatment of LF include (1) the prevention of anti-fibrosis effects, (2) mechanisms, and (3) clinical efficacy, safety and quality control . Clinically, several studies reported the efficacy of CHM on LF [9–11]. A previous systematic review of 11 studies on LF suggested that "Fuzheng Huayu Capsule" had beneficial effects on LF . However, the review included only one CHM compound, and the results might not be representative of all CHM. Moreover, with advanced progress on LF in recent years, the review should be updated to include recent studies. 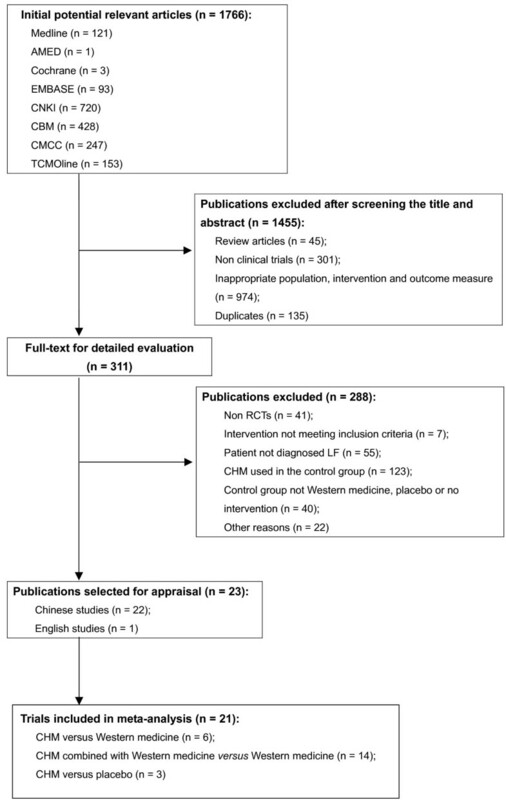 This article aims to systematically review the published randomized controlled trials (RCTs) for evaluating the effectiveness of CHM on LF treatment. This study was conducted according to the Cochrane practice [13, 14], including pre-specified objectives, search strategy, inclusion criteria, quality assessment, data collection and meta-analysis. Published RCTs on CHM treating LF patients were searched via the following electronic databases from their inception to March 2011: MEDLINE since 1948, AMED since 1985, EMBASE since 1974, and The Cochrane Central Register of Controlled Trials since 1996. In addition, four Chinese electronic databases including China National Knowledge Infrastructure (CNKI), TCMOnline, Chinese Biomedical Literature Database (CBM), and Chinese Medical Current Contents (CCMC) were searched since January 2000. The bibliographies of studies identified in the systematic search were checked for potentially relevant publications. Unpublished data were not included. The keywords for database search were ('liver fibrosis' OR 'hepatic fibrosis' OR 'fibrotic liver' OR 'antifibrotic') AND ('Chinese medicine' OR 'traditional medicine' OR 'herbal medicine' OR 'complementary medicine' OR 'complementary therapy' OR 'alternative medicine' OR 'Fuzheng huayu' OR 'compound 861' OR 'Anluohuaxian pill' OR 'Rhubarb zhechong wan' OR 'Sho saiko to' OR 'Fufang biejiaruangan tablet' OR 'Biejia ruanjian' OR 'Biejiajian pill' OR 'Qianggan capsule' OR 'Qianggan pill' OR 'Han-Dan-Bi-Tuo' OR 'Matrine capsule' OR 'Oxymatrine capsule' ) AND 'randomized controlled trial' . No restrictions on publication type and language of publication were imposed. This review included only RCTs on the effectiveness of CHM. The studies with quasi-randomized and non-randomized study design were excluded. The studies recruited patients suffering from chronic hepatitis diseases, fatty liver or schistosomiasis japonica, and having histologically significant LF were included. The studies involved patients having co-infection of two or more types of hepatitis or fatty liver with other chronic liver diseases, or having decompensated liver diseases were excluded. The studies comparing CHM (such as pills, tablets, capsules, decoctions, and injections) with placebo, Western medicine, or no intervention were included. CHM intervention could be a sole anti-fibrotic therapy or an adjunct treatment. The studies assessing combined effects of CHM with other intervention (e.g. CHM plus acupuncture, injection of CHM into acupoint, and acupoint application) were excluded. The studies used non-conventional herbal medicines or complementary medicines as control groups were also excluded. Co-intervention, including those supplements such as vitamins, was allowed if both arms of the randomized allocation received the same co-intervention. Primary outcome measures were mean differences (MD) of LF biomarkers, which indicate ECM metabolism, including serum hyaluronic acid (HA), laminin (LN), procollagen type III (PC-III), type IV collagen (IV-C), matrix metalloproteinase (MMP), and tissue inhibitors of metalloproteinase (TIMP) . Secondary outcomes included liver biochemistry which including alanine aminotransferase (ALT) and aspartarte aminotransferase (AST), and the improvement of related clinical symptoms was defined as the alleviation of subjective symptoms after the interventions. Both non-serious and serious adverse events were evaluated. A serious adverse event included event of death, life-threatening incidents, or inpatient or prolonged of hospitalization which resulted in a persistent or significant disability . Was the study free of other problems that could put it at a risk of bias? Every item would be given 2 points for answering 'yes', 1 for answering 'unclear' and 0 for answering 'no'. Prevention of knowledge of the allocated interventions, i.e. blinding (patient, personnel, and outcome assessor blinding), was assessed separately. There were eight items in total as three items from blinding (including blinding of patients, personnel, and outcome assessor), and five from the rest five questions. The scale ranged from 0 to 16 points with 0 to 7 regarded as poor quality, and 8 or above as good quality. Any disagreement was resolved by consensus. If necessary, the third author (YF) was consulted for resolution. Review Manager, Version 5.1 for Windows (The Nordic Cochrane Centre, Copenhagen, Denmark) and STATA 10.1 (StataCorp, College Station, TX, USA) were used for data analysis. Meta-analysis was carried out on the intention-to-treat (ITT) basis regardless whether the subjects were lost to follow-up. Subgroup analysis was conducted among different comparisons (including CHM versus Western medicine, CHM versus placebo, and combined treatment versus Western medicine) and study quality (all studies versus the studies with good quality). Inverse-variance random effects model was used MD and 95% confidence intervals (CI) were calculated. Heterogeneity was assessed by examining the forest plots and I 2 statistics, where I 2 values of 25%, 50%, and 75% were regarded as low, moderate, and high heterogeneity, respectively . Sensitivity analysis for primary outcomes was performed to assess the impact of excluding outlier studies when there was high heterogeneity (I 2 > 75%) between studies. In a three-arm study that had two control groups of conventional medicine and no intervention, the treatment group was split into two groups to create two comparisons in the meta-analysis. Funnel plot and Egger's regression asymmetry test were applied to detect for the potential publication bias . P value less than 0.05 were considered statistically significant. Figure 1 shows the process of the study selection. Twenty-three RCTs with a total of 2123 participants met the eligibility criteria were included in this review (Table 1). Sample sizes ranged from 44 to 164. Among these included studies, a study recruited schistosomiasis japonica patients only , the remaining recruited patients with chronic HBV infection. All of the identified studies were conducted in China and published in Chinese language, and only one study was published in English language . Three studies used three-arm study design (2 intervention groups compared with 1 control group, or 1 intervention group compared with 2 control groups) [21–23] and others used two-arm study design (1 intervention group versus 1 control group) [20, 24–42]. No study reported mortality, liver cirrhosis or cancer, quality of life or cost as outcomes. The information about the study design, participants, intervention, outcome assessment, and quality was presented in Additional file 1. ALT, AST & Improvement of related clinical symptoms. The types of intervention were classified as CHM (N = 8) and combined treatment (CHM plus Western medicine) (N = 15) including Interferon (IFN), Entecavir, Adefovir Dipivoxil, and Lamivudine (LVD). CHM was prepared as decoctions (N = 7), tablets (N = 8), granules (N = 2), capsules (N = 2), pills (N = 3), and oral liquid (N = 1). Only standardized (87%, 20/23) and semi-standardized (13%, 3/23) CHM prescriptions were used in these studies. The standardized prescriptions indicate fix formulas for all participants and the semi-standardized prescriptions were defined as individually customized formulas according to Chinese medicine. Comparison groups included Western medicines (including IFN, Entecavir, Adefovir Dipivoxil, and LVD), placebo, and no intervention. Three studies used placebos, with one using physiological saline and food coloring , and two using similar shape capsules [20, 41]. The range of intervention duration in the studies ranged from 60 days to two years with mostly were six months (N = 7) and one year (N = 7). The duration of follow-up was only reported in three studies with a range from three to six months [27, 30, 34]. Fifteen studies were graded as good quality and others as poor quality (as shown in Additional file 1). Out of 23 included studies, only two studies reported adequate generation of allocation sequence using random number tables or drawing of lots for assigning groups [29, 41]. None of the studies described the method of allocation concealment. Only one study reported using blinding design (single blind without description of the blinding method)  and three studies used placebos [20, 30, 41]. Six studies did not provide the information on missing data [28, 29, 33–35, 41]. None reported the use of ITT in their analysis. Figures 2, 3, 4 show the forest plots of MD of LF markers (HA, LN, PC-III & IV-C) with 95% CI. 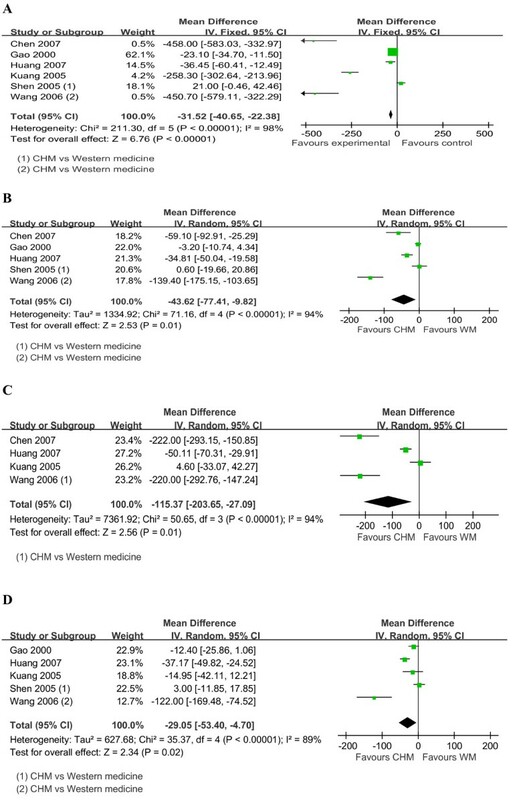 Forest plot of studies comparing Chinese herbal medicine and western medicine, examining the effect on liver fibrosis markers (including HA, LN, PC-III and IV-C). (A) HA. (B) LN. (C) PC-III. (D) IV-C. Vertical line represents no effect point; CI, confidence interval; HA, hyaluronic acid; LN, laminin; PC-III, procollagen type III; IV-C, type IV collagen. Forest plot of studies comparing Chinese herbal medicine and placebo medicine, examining the effect on liver fibrosis markers (including HA, LN, PC-III and IV-C). (A) HA. (B) LN. (C) PC-III. (D) IV-C.
Forest plot of studies comparing combined medicine and western medicine, examining the effect on liver fibrosis markers (including HA, LN, PC-III and IV-C). (A). HA. (B) LN. (C) PC-III. (D) IV-C.
CHM significantly reduced the levels of HA (pooled MD-31.52; 95% CI-40.65, -22.38; P < 0.00001), LN (pooled MD-43.62; -77.41, -9.82; P = 0.01), PC-III (pooled MD-115.37; -203.65, -27.09; P = 0.01) and IV-C (pooled MD-29.05; -53.4, -4.7; P = 0.02), with I 2 ranging from 89% to 98%, as shown in Figure 2. 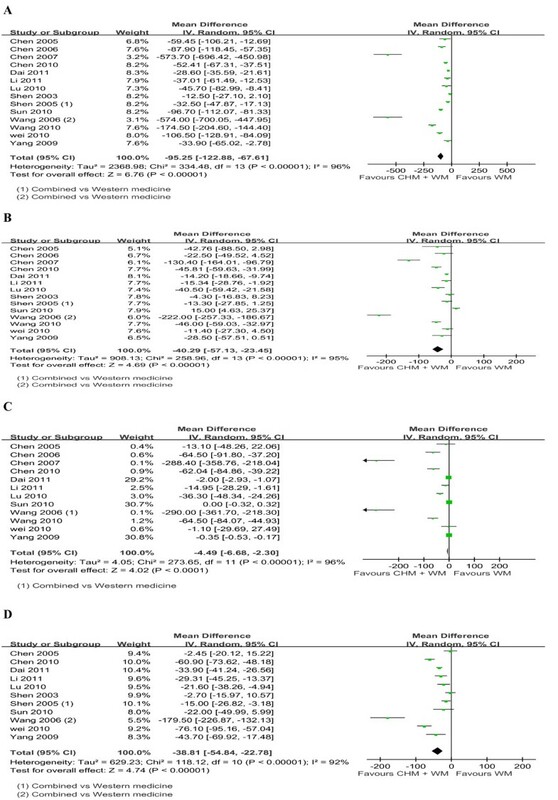 Subgroup analyses among studies with different quality also found substantial significant differences in favor of CHM in the levels of HA (pooled MD -292.65; 95% CI-481.77, -103.54; P = 0.002), LN (pooled MD-76.28; -136.23, -16.32; P = 0.01), PC-III (pooled MD-115.37; -203.65, -27.09; P = 0.01) and IV-C (pooled MD -52.05; -93.95, -10.15; P = 0.01), with I 2 ranging from 86% to 98%. The significance differences were maintained for the levels of HA (pooled MD - 21.46; 95% CI -30.80, - 12.13; P < 0.00001), LN (pooled MD -21.01; 95% CI -43.49, 1.47; P = 0.07), and IV-C (pooled MD -15.65; 95% CI -34.57, 3.26; P = 0.1) when excluding the studies with outlier results, with I 2 ranging from 83% to 96%. For PC-III (pooled MD -221.02; 95% CI -271.89, -170.15; P < 0.00001), the heterogeneity was largely reduced after removing two potential outlier studies [27, 29] (overall I 2 = 0%). CHM had no significant effects on the levels of HA (pooled MD -77.82; 95% CI-156.67, 1.03; P = 0.05), LN (pooled MD -74.59; -167.93, 18.75; P = 0.12), PC-III (pooled MD -17.09; -51.09, 16.91; P = 0.32) and IV-C (pooled MD -43.71; -98.45, 11.03; P = 0.12) when compared with placebo, with I 2 ranging from 93% to 99%, as shown in Figure 3. Subgroup analysis showed the same estimates for quality and sensitivity analyses excluding outliers found similar results for the levels of HA (pooled MD -41.80; 95% CI-109.68, 26.08; P = 0.23), LN (pooled MD -11.51; 95% CI -46.48, 23.46; P = 0.52), and IV-C (pooled MD -19.69; 95% CI-49.15, 9.76; P = 0.19) A large high heterogeneity was observed (I 2 ranging from 87% to 92%) except in IV-C (I 2 = 49%). Combined treatment was found to significantly reduce the levels of HA (pooled MD -46.59; 95% CI -51.23, -41.944; P < 0.00001), LN (pooled MD -40.292; -57.13, -23.45; P < 0.00001), PC-III (pooled MD -4.49; -6.68, -2.3; P < 0.0001) and IV-C (pooled MD -38.81; -54.84, -22.78; P < 00001) compared with Western medicine, Western medicine, with I 2 ranging from 92% to 96%, as shown in Figure 4. Subgroup analyses showed high significant differences for good quality studies in the levels of HA (pooled MD -121.46; 95% CI-166.40, -76.51; P < 0.00001), LN (pooled MD -58.53; -88.38, -28.68; P = 0.0001), PC-III (pooled MD) - 13.14; -18.81, -7.48; P < 0.00001), and IV-C (pooled MD -44.45; -68.17, -20.73; P = 0.0002), with I 2 ranging from 93% to 97%. Sensitivity analyses excluding outliers found similar estimated and heterogeneity in the levels of HA (pooled MD -41.94; 95% CI-46.65, -37.23; P < 0.00001), LN (pooled MD -24.22; -33.77, -14.67; P < 0.00001), PC-III (pooled MD -2.57; -4.20, -0.94; P = 0.002) and IV-C (pooled MD -30.53; -44.35, -16.70; P < 0.0001), with I 2 ranging from 80% to 94%. Comparing with Western medicine, combined treatment was statistically significant in reducing ALT level (pooled MD -11.35; 95% CI -18.75, -3.95; I 2 = 85%; P = 0.003). No significant difference was found in AST level (pooled MD -1.13; 95% CI -6.56, 4.3; I 2 = 52%; P = 0.68). However, when comparing CHM with Western medicine and placebo, no significant difference was found for the levels of ALT (For CHM versus Western medicine: pooled MD -14.59; 95% CI -37.190, 8; I 2 = 95%; P = 0.21. For CHM versus placebo: pooled MD -18.64; -52.89, 15.61; I 2 = 73%; P = 0.29) and AST (For CHM versus Western medicine: pooled MD 9.7; -3.37, 22.76; I 2 = 88%; P = 0.15. 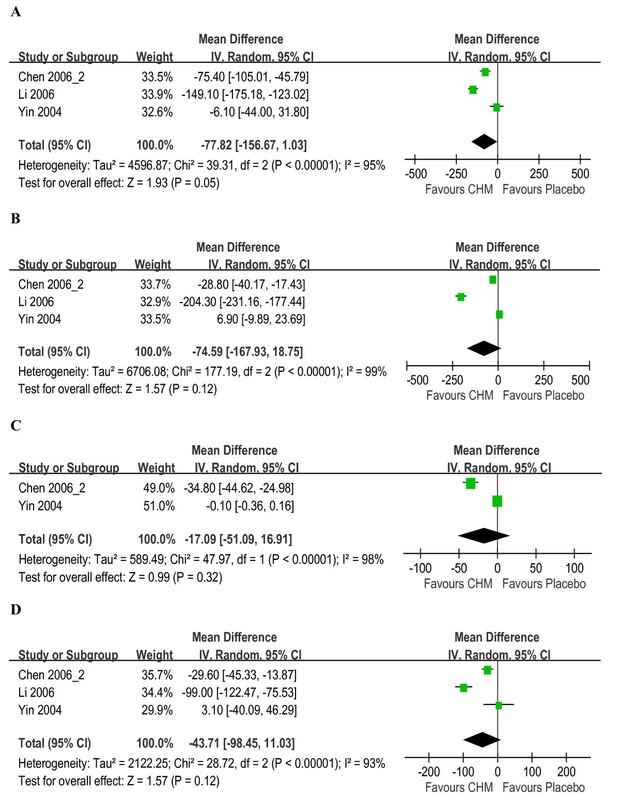 For CHM versus placebo: pooled MD -17.94; -37.57, 1.69; I 2 = 37%; P = 0.07). Eleven studies [20, 26, 29, 30, 32–34, 36, 39, 41, 42] reported symptom improvement with eight studies [20, 29, 30, 32, 33, 36, 39, 42] reported statistically significant difference (P < 0.05) in the outcomes comparing CHM with Western medicine, placebo, and no intervention; and comparing combined treatment with Western medicine. One out of the eleven studies comparing CHM with placebo reported a non-significant improvement . Although adverse events were reported in nine studies, none was serious. Among these, three reported no adverse event in both groups [31, 32, 35] while one reported no adverse event for CHM . Five reported gastrointestinal discomfort and drug-allergic symptoms for CHM, placebo, IFN and LVD [20, 21, 27, 30, 41]. One reported two cases with dizziness using the combined treatment . Other adverse symptoms of flu-like symptoms or mild leucopenia and thrombocytopenia were related to the use of IFN or LVD [21, 22, 27]. No study described the method of data collection for adverse events. Publication bias was found for HA (P = 0.003), PC-III (P = 0.001) and LN (P = 0.047) although non-significant for IV-C (P = 0.814) according to Egger's test. However, visual inspection of the funnel plots (please see funnel plots in Additional file 2) found no obvious basis. The levels of LF markers were significantly reduced in patients receiving CHM or combined treatment compared with Western medicine. The levels were significantly decreased in CHM group compared with no intervention although the effect was not significantly different when in comparison with Western medicine or placebo. Moreover, CHM was found to be effective in symptom improvements. It should be noted that CHM was not consistently better than placebo. Eight studies [21, 25, 28, 31, 33, 34, 36, 37] were assessed to be poor quality according to modified Cochrane 'risk of bias' scale. Only two studies reported the method of randomization [34, 41]. The method of allocation concealment was not reported by all studies, which should be alert to the possibility of selection bias and overestimation of intervention effects . Blinding was not reported or inappropriately reported by most of the studies. Although most studies used objective outcome measures, it did not rule out the possibility of performance bias and detection bias . Strict eligibility criteria were used to reduce heterogeneity. The included studies, however, had various participants' characteristics and different CHM or combined treatment against different control interventions. Small sample sizes, methodological differences between studies and variations in study objectives might contribute to heterogeneity. To investigate the high levels of heterogeneity in this meta-analysis we performed subgroup analysis and sensitivity analysis. These analyses did not find inconsistency. Some high quality studies might be missed due to the strict eligibility criteria such as a multicentre, double blinded RCT comparing "Fuzhenghuayu capsule" with "Heluoshugan capsule" . Other reviews including CHM as control may be needed in the future. As most studies were of small scale and poor methodological quality, large RCTs of high quality would be required for determining the effectiveness of CHM on LF treatment. In order to minimize bias in the review, we did not restrict the publication type and language, and searched many commonly accessed databases. However, all identified studies were conducted in China, and studies more likely reported positive results, which may be influenced by publication and location bias [46–48]. Our analysis of publication bias using Egger's test did show publication bias in the outcomes of HA, LN, and PC-III, although the funnel plots were symmetric in distribution (Additional file 2). Most of the current studies only focused on the effectiveness of intervention  but neglected monitoring the harmful effect from CHM. Further studies should assess both the safety and effectiveness. Well-designed, multi-centre and large sample size RCTs in compliance with the CONSORT guideline  should be implemented. Studies with CHM should be registered before their conduct. The current inconclusive studies are of poor methodological quality and high heterogeneity do not adequately support the effectiveness of CHM treatment on LF. Large RCTs using standardized Chinese medicine syndrome diagnosis and CHM formulae with longer follow-up are required for further evaluation. The study was financially supported by grants from the research council of the University of Hong Kong (Project Codes: 10400413 and 10400699) and Hong Kong Hospital Authority's funding for Chinese Medicine (Project Code: 20006345). The authors are grateful for the support of Professors Yung-chi Cheng, Sun-Ping Lee, and Allan SY Lau. FC conducted the database search, assessed studies for inclusion, extracted and analyzed the data, and drafted the manuscript. YF conceived the study, analyzed the data, and revised the manuscript. NW conducted the database search, assessed studies for inclusion, extracted the data which followed by cross checking with FC, analyzed the data, and drafted the manuscript. MFY, YT and VTW interpreted the data and revised the manuscript. All authors read and approved the final version of the manuscript.